Recently, National Geographic launched a new initiative called Your Shot that allows photographers from all walks of life to connect with Nat Geo photographers and editors over virtual assignments. Centered around a specific theme, each assignment asks photographers to share their best shot. Then, Nat Geo photo editors offer their expert photography tips to show everyone what made that particular photo stand out. If they love your shot, your photo may even get published in National Geographic Magazine! The current assignment is called Explore Our Changing World. Over 10,000 photographers have submitted their photos that capture the idea of change, whether that be in nature, in urban areas or within ourselves. Courtesy of National Geographic, here are 10 standout photos from that assignment, which ends on October 22. You still have 12 days left to submit your own best photo. While we’ve all seen our fair share of hyperrealistic and photorealistic art, or paintings and sculptures that look amazingly like photographs, it’s not too often that we come across photos that look like paintings. Throughout the five-plus years we’ve been around, we’ve seen these unbelievable photos pop up here and there and today, we decided to give them all one home. Here, then, are ten fascinating photos that look unbelievably like an oil, acrylic or watercolor painting. Enjoy! 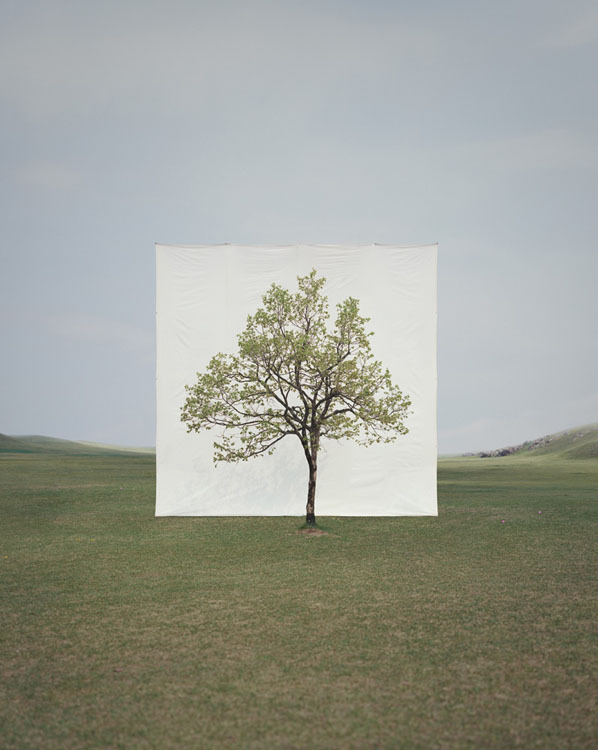 For his project titled “Tree,” South Korean photographer Myoung Ho Lee found solitary trees out in nature and then erected giant white canvas backdrops behind them. 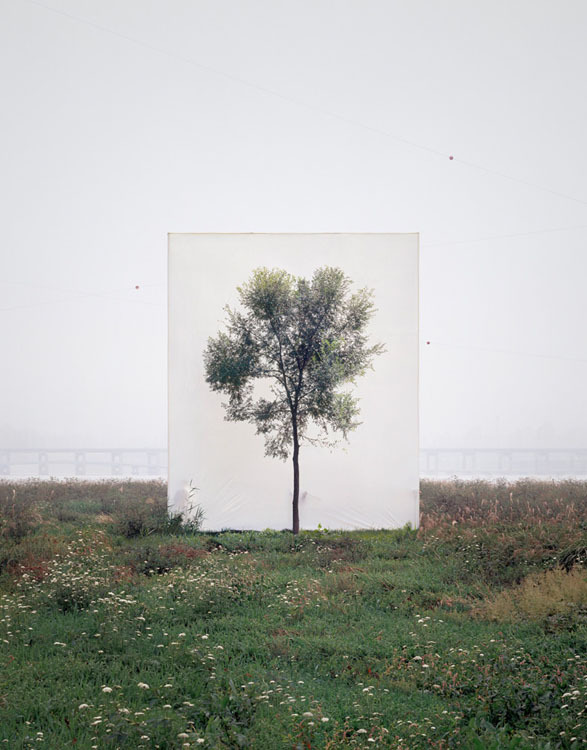 He then created photos showing the trees surrounded by artificial boxes in their natural surroundings. 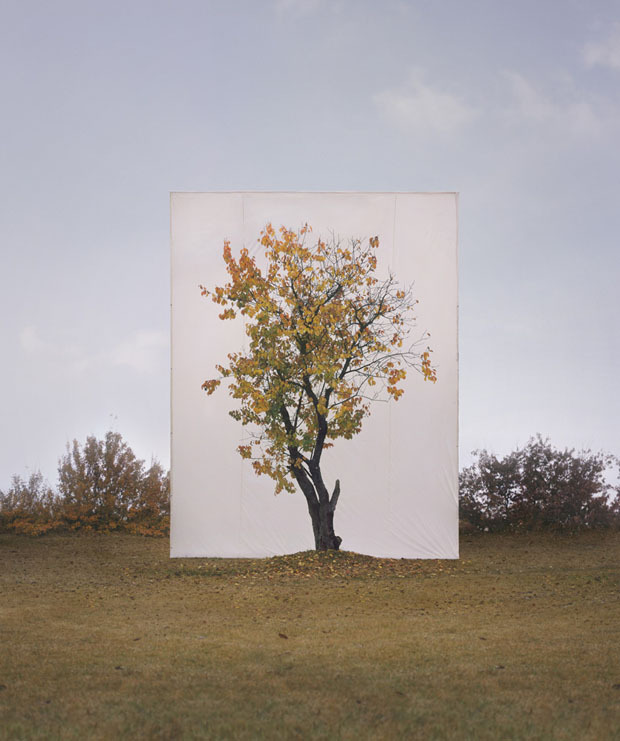 The trees are of different species, and the photos — captured with a 4×5 camera — were shot in different seasons and at different times of the day. The canvases are roughly 60 feet tall and 45 feet wide. They’re so big that the photographer has no way of putting them up himself, so he enlists the help of a production crew and two heavy cranes to do the job. 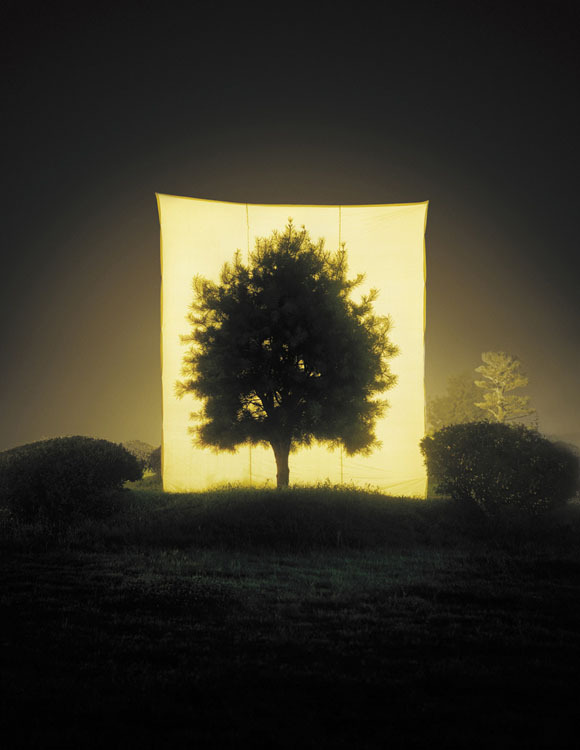 Mr. Lee allows the tree’s natural surroundings to fill the frame around the canvas, transforming the backdrop into an integral part of the subject. 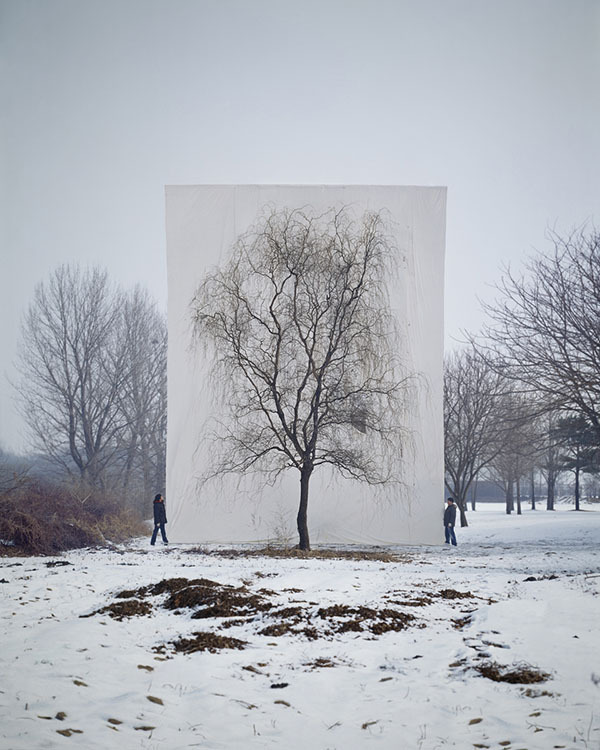 Centered in the graphic compositions, the canvas defines the form of the tree and separates it from the environment. 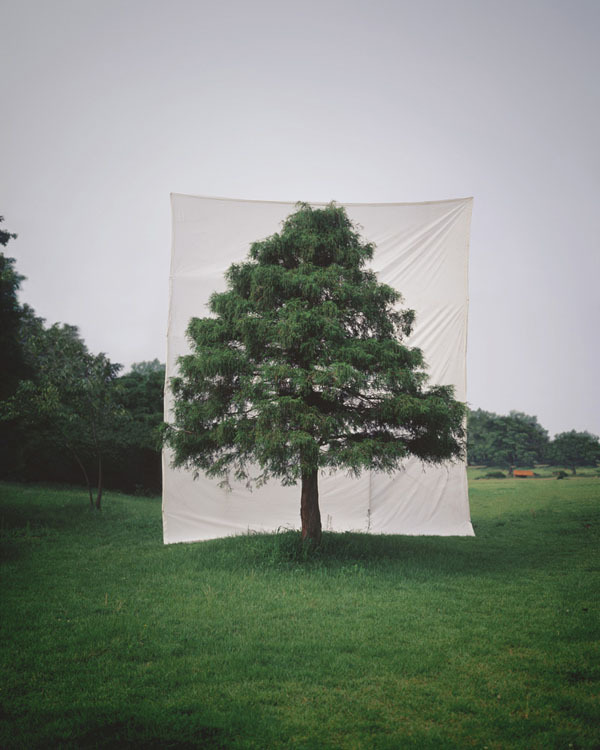 By creating a partial, temporary outdoor studio for each tree, Mr. Lee’s “portraits” of trees play with ideas of scale and perception while referencing traditional painting and the history of photography. You can see more of these works over at the Yossi Milo Gallery. Untitled #152, 2008.Simen Johan/Yossi Milo Gallery, NYC. Johan’s skill lies in creating images of a perhaps-not-so-mythical future world where creatures are depicted in the wrong environment, and beasts that shouldn’t coexist do just that. These tremendous images certainly have a footing in the tradition of naturalists such as John James Audubon. Johan’s work, which has contemporary counterparts in artists like Walton Ford, presents an alternative to the traditional view of the natural world in which the influence of humanity’s excesses is sensed, if not immediately seen. Untitled #169, 2011, and Untitled #155, 2010.Simen Johan/Yossi Milo Gallery, NYC. Untitled #168, 2011.Simen Johan/Yossi Milo Gallery, NYC. 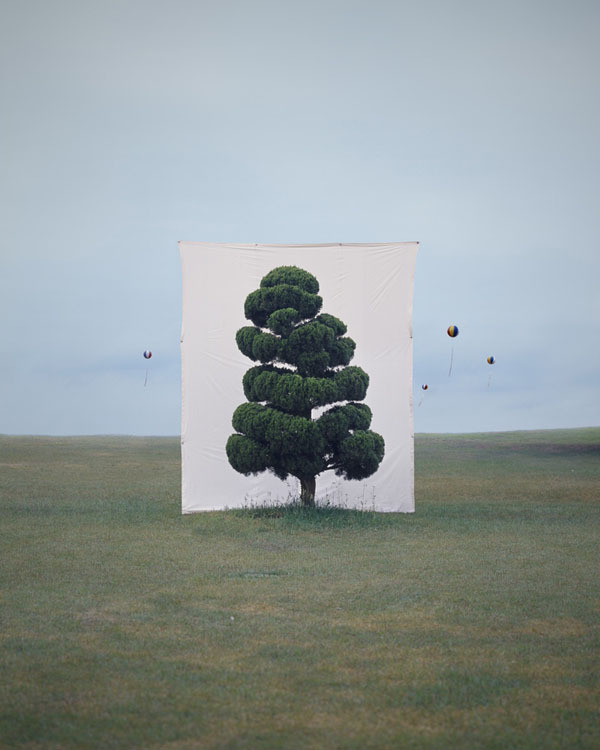 Untitled #159, 2010.Simen Johan/Yossi Milo Gallery, NYC. Untitled #133, 2005.Simen Johan/Yossi Milo Gallery, NYC. Talking about his project, Johan writes, “When working on an image, I strive to create tension and confuse the boundaries between opposing forces, such as the familiar and the otherworldly, the natural and the artificial, the amusing and the eerie. I often feel like I am attempting to reconcile the irreconcilable as I explore the paradoxical nature of existence, its simultaneous abundance of beauty and horror. For example, in one of my photographs, two moose in combat are set upon by a flock of tropical parakeets behaving at once ravenous and playful. The overlapping ecosystems—northern moose, tropical birds, and signs of human civilization in the desert valley below—evoke a world where human intervention has caused ecological disarray.” The result is work that is both imaginative, thought-provoking, and more than a little foreboding about what our world could look like someday. All photographs © Simen Johan and courtesy of Yossi Milo Gallery, New York City. Untitled #137, 2006, and Untitled #163, 2011.Simen Johan/Yossi Milo Gallery, NYC. Untitled #156, 2009.Simen Johan/Yossi Milo Gallery, NYC. Untitled #154, 2008.Simen Johan/Yossi Milo Gallery, NYC. Untitled #153, 2008.Simen Johan/Yossi Milo Gallery, NYC. Though not much is known about photographer Adnan Bubalo, his stunning nature and landscape photos speak for themselves. His most captivating works feature the hills of Tuscany in central Italy. With its spectacular rolling hills and surrounding scenery, Tuscany is one of Italy’s top vacation destinations and a dream for photographers worldwide. Bubalo’s photos of Tuscany stand out because of the way he captures layers, colors and light. As the morning fog blankets the hills and the sun peeks through the sky, Bubalo is right on the scene. His beautfully prismatic photos only seem to accentuate the natural colors of the sky.